Gracie's PVD keeps popping up as a favorite of so many of the people who've been featured in the "My RI Life" series on the blog that I decided to go back last night for what ended up being a group dinner. After leaving the Uber driver who'd brought me downcity with a copy of the July 2015 issue of RI Monthly* of course. (I've decided that whenever people ask me what I do for a living, I'm now going to hand them a copy of the magazine. In fact, I'm even carrying extra copies around with me specifically for that purpose. No joke.) But I digress...What I really want to talk about is Gracie's. After having been back, I feel like I can - and should! - give you a few tips on how to maximize your dining experience there. But don't despair because the lighting in the bathroom at Gracie's is perfect for a mirror selfie - if you're into that sorta thing - for Facebook and Instagram. #NoFilter or photoshop needed. (Good lighting is everything. Totally serious.) Also, be warned, if you post that selfie on the FB business/fan page for your blog, you will wake up at 7am the next morning to at least one snarky comment left by a #hater (which makes me think that I was remiss in NOT including any mention of haters in my post from the other day, the one about what to watch out for when launching your own blog). Freshly baked cookies. Yes, the valet leaves them in your car. For the ride home. 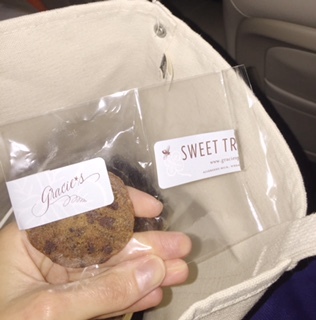 Not having to find parking downcity and getting warm cookies (made at nearby Ellie's Bakery which our dinner companions Phoebe and Julian swear has the best cookies, cappuccinos and macaroons in the state and is owned by the same peeps behind Gracie's) is a sweet deal, right? And remember: Don't trust anyone who won't sample at least one cookie from Gracie's. Unless they have a severe (legit) gluten allergy, it's a red flag. They're that good! *PattyJ.com is one of four RI blogs featured on page 22 of the July issue (the one with the lobster on the cover) of RI Monthly. Photo Credits: All photos courtesy of us.